Gateway To Success: Our Learning. Their Future. How are you creating and sustaining equity and excellence in teaching and learning every day? Share your expertise with educators from around the world. 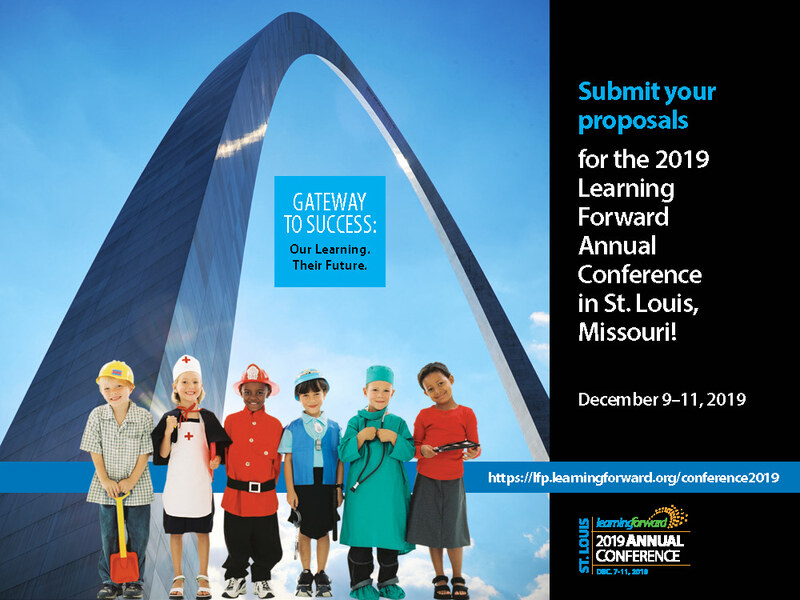 Submit a proposal to present at Learning Forward’s 2019 Annual Conference in St. Louis, December 7-11, 2019. Our Annual Conference offers education leaders and policy makers the connections, tools, learning opportunities, and strategies they need to understand and implement effective professional learning in their classrooms, schools, and districts. Submit your proposal to present a concurrent session and join your colleagues in exploring best practices in professional learning. The proposal deadline is February 4, 2019. Click here to submit your proposal. The theme for the 2019 Learning Forward Annual Conference, Gateway To Success: Our Learning. Their Future. invites education leaders and policy makers to share expertise focused on creating and sustaining equity and excellence in teaching and learning every day. The conference program offers opportunities to make connections, share and learn about tools and strategies to understand and implement effective professional learning in classrooms, schools, and districts. The Standards for Professional Learning come to life through sessions that highlight successes and challenges. The 2019 conference will begin with preconference sessions on Saturday and Sunday,December 7-8. A Welcome Reception and Affiliate Networking will be held onSunday, December 8 after Academy Graduation. Content Monday through Wednesday will include 2- and 3-hour concurrent sessions, as well as a general session, networking lunch or brunch and a keynote address each day. Other session types include thought leader lectures and panels, roundtables (45 min), and networking sessions. Monday will once again feature all-day (5-hour) deep engagement sessions. If you are interested in submitting a concurrent session proposal, please complete the online form at lfp.learningforward.org by February 4, 2019. We will notify you with additional details in early April. If you have questions, please reach out to Zach Sherburn, zach.sherburn@learningforward.org or call 972-421-0900. We look forward to hearing from you and continuing our shared mission together.